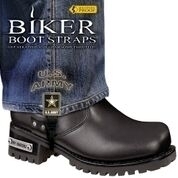 All New Weather Proof Boot Straps! The fourth generation boot straps are made with nylon clips with sure-lock technology and durable rubber straps to keep your pants in place like no other product before it. Because of the materials that we are using they perform in the rain as well as a muddy field. Biker Boot Straps went with a self adjusting rubber strap so it did not get in the way of the operation of the motorcycle. Another reason for not having an adjustment is that our straps will not become unadjusted and drag while you walk. Our 4" strap is perfect for women where as the 6" strap is made for the average mans shoe sizes. The 4" strap stretches to roughly 7" and the 6" strap stretches to about 11". Our new clip design is made with high quality nylon with a heat treated metal insert for a sure-lock experience. These clips hold stronger and last longer than the typical suspender clip that has been used as the industry standard. We even double machine pressed the decorative emblems onto the clips for durability which will keep the emblems from spinning on the clip with age. The new clip even has the ability to interchange new emblem designs without having to buy the whole strap which will keep cost down if you break one or just want to have a couple different styles. These are professional grade boot strap straps so don't mess around with cheaper, poorly designed straps that won't stay in place and buy the strap that will stand the test of time! 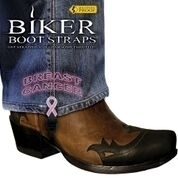 Biker Boot Straps has engineered the best boot straps money can buy and we will continue to do so until every biker is strapped up. So get strapped and grab some throttle!